Starting 2017, nurses under the Nurse Deployment Project (NDP) will have regular positions at the Deparment of Health, a DOH official said. The NDP, formerly known as RNHeals, is a DOH program that sends nurses to communities. Nurses under this program are hired on a contractual basis. Under the Duterte administration, that system of hiring will change effective next year. 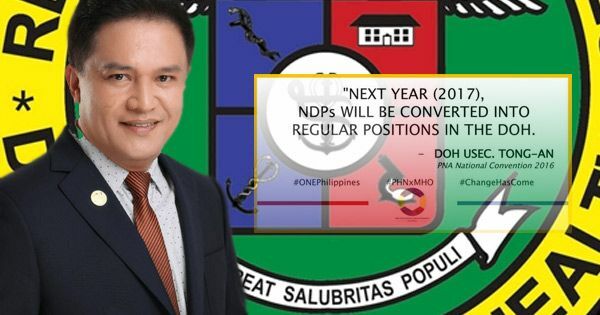 Quoting DOH Undersecretary Roger Tong-an, a Facebook post by radio anchor and businessman Carl Balita says that by "next year (2017), NDPs will be converted into regular positions in the DOH." Dr. Tong-an is one of the new senior officials appointed recently by President Rodrigo Duterte, nearly a month after the chief executive declared appointive government posts vacant. The health official reportedly made the announcement during a convention spearheaded by the Philippine Nurses Association (PNA), one of the largest nursing organizations in the country. According to the same FB post, public health nurses will also serve as Municipal Health Officers (MHOs) of local government units (LGUs) to replace physicians. Currently, MHOs in LGUs are medical doctors. This came as a good news for most Filipino nurses, but some expressed their concern on the process of selection and hiring as it allegedly (and sadly) involves what many call "palakasan system." The only hope I have is that politicking in the hiring for this program will totally be abolished.. It's too hard when you see qualified professionals not given the chance simply because they do not have a strong "backer".